To Cite: Mahdaviazad H, Javidialesaadi F, Hosseinzadeh M, Masoompour S M. Turnaround Times for Hematology and Chemistry Tests in the Emergency Department: Experience of a Teaching Hospital in Iran, Shiraz E-Med J. 2016 ; 17(4-5):e37101. doi: 10.17795/semj37101. Background: Tracking turnaround times (TATs) can improve the quality of care and decrease the economic burden of patient care. Objectives: The aim of this study was to measure current TATs in a hospital emergency department (ED) and to analyze the contribution of prelaboratory and laboratory phases to the total TAT. Materials and Methods: This cross-sectional study was performed during November and December 2014 and included all patients admitted to the ED and for whom the physician had ordered routine hematology and chemistry tests. The total TAT comprised seven time points and six time intervals. The start point was when the test was ordered by the physician, and the end point was when the results were verified and reported. The data were analyzed with SPSS software (version 11.5). A P value of less than 0.05 was considered statistically significant. Results: During the study period, time data were provided for 1400 ED tests. The mean total TAT for all tests ranged from 1.3 to 3.1 hour. On weekdays, the longest TAT (2.5 ± 0.9 hours) was on Sundays, and the shortest TAT (1.9 ± 0.7 hours) was on Fridays (P < 0.001). The mean total TAT for all tests was significantly longer in the morning shift than in the night shift (2.8 ± 1.2 hours vs. 2.0 ± 0.7 hours, P < 0.001). The laboratory phase accounted for a significantly higher proportion of the TAT (57.4%) than the prelaboratory phase. Conclusions: This study suggests that the mean TAT in this teaching hospital is longer than the benchmark. Further research is needed to determine the causes of delays and develop interventions to solve this problem. The quality of medical care can be defined as the ability of services to improve patients’ health outcomes and meet users’ expectations (1, 2). Traditionally, physicians and laboratories have disagreed on how to define quality with reference to laboratory services (2). Laboratories focus primarily on precision and accuracy, whereas clinicians emphasize timeliness and the costs of the service (2, 3). Despite these disagreements, the turnaround time (TAT) is one of the most important indicators of the quality and effectiveness of laboratory services (4, 5). Different definitions of TAT have been published (1, 2, 5, 6). The total TAT is the time from when a test is ordered to when the result is verified and ready to use to manage the patient’s care. The laboratory TAT is the time from when the laboratory receives the specimen to when the result is confirmed and reported (2, 6, 7). A prolonged TAT translates into delays in diagnosis and patient management, increased lengths of hospital stays, and ultimately, patient dissatisfaction (2, 5, 8). The average laboratory TAT varies, with a TAT of 45 hours reported for emergency samples in India (4) to 40 ± 21 minutes for samples from an emergency department (ED) in Iran (9). A median of 1 hour, with a range of 1 - 26 hours, was reported for all samples obtained in U.K. hospital wards (10), and a study in the U.S. found a TAT of 90 minutes for routine inpatient tests and 35 minutes for stat inpatient samples (11). Although the management of patients in the ED requires quick access to laboratory results and reliable hospital information systems, issues with TAT currently remain a source of dissatisfaction. To the best of our knowledge, there are no studies on the total and laboratory TATs in Iran. We designed the present study to measure current TATs for hematology and clinical chemistry tests in the ED of a university hospital and to determine the relative contributions of the prelaboratory and laboratory phases to the total TAT. This cross-sectional hospital-based study was conducted during November and December 2014 and was approved by the ethics committee of Shiraz University of Medical Sciences. The study setting was the ED of a general tertiary care teaching hospital in Shiraz, Iran. This 368-bed center is one of the largest referral hospitals in southern Iran, with more than 20,049 ED admissions and 147,286 ED laboratory test ordered annually (12). All routine chemistry and hematology tests of patients who were admitted on November 3 (Monday), November 11 (Tuesday), November 19 (Wednesday), November 27 (Thursday), December 5 (Friday), December 13 (Saturday), and December 27 (Sunday) of 2014 were included. The November/December period was selected because ED patient loads are average at this time of the year, according to the hospital’s database. All patients scheduled for ED admission and for whom the physician had ordered routine hematology (CBC, PT, and PTT) and chemistry (FBS, blood urea nitrogen (BUN), Cr, Na, and K) tests were included. In addition to being the most common tests requested by the ED of the hospital, these tests are also the most important rate-limiting step in patient management and discharge. Patients with hemolytic disorders or whose specimens were insufficient for testing were excluded from the analysis. The laboratory equipment used in our hematology and chemistry laboratory consists of the following: a Sysmex K-21 hematology analyzer (Sysmex, Kobe, Japan), with a manufacturer-reported throughput of 60 specimens/h; a Sysmex XT 1800 I hematology analyzer, with a manufacturer-reported throughput of 60 specimens/ h; a Stago STA compact CT/2001 analyzer (Diagnostica Stago, Asnieres, France), with a manufacturer-reported throughput of 60 specimens/h; a Human Humastar 600 auto analyzer (Human, Wiesbaden, Germany), with a manufacturer-reported throughput of 450 specimens/h; a Selectra XL auto analyzer (Vital Scientific, Dieren, The Netherlands), with a manufacturer-reported throughput of 380 specimens/h; a Prestige Automated Analyzer 24 I Auto analyzer (Boeki, Tokyo, Japan), with a manufacturer-reported throughput of 170 specimens/h; a DiruI CS-T 240 auto analyzer (New and High Tech, Jilin, China), with a manufacturer-reported throughput of 200 specimens/h; a Hycel IPHF flame photometery electrolyte analyzer (Hcyel Groupe Lisabio, Pouilly-en-Auxois, France), with a manufacturer-reported throughput of 800 specimens/h; a Convergys ISE Comfort electrolyte analyzer (Convergent Technologies, Coelbe, Germany), with a manufacturer-reported throughput of 180 specimens/h; and a Convergys ISE Caretium XI 921 A electrolyte analyzer (Caretium Medical Instruments, Coelbe, Germany), with a manufacturer-reported throughput of 60 specimens/h. After coordination with the hospital management and obtaining permission to use the data, a team of trained researchers (who were not employees of the hospital) used a synchronized digital timer and specially designed checklist to record the time of each event in real time. In this study, the total TAT consisted of seven time points and six time intervals. With regard to the total TAT, the start point was when the test was ordered by the physician, and the end point was when the results were verified and reported (Figure 1). - Analysis to result verification: the interval from when the test was done to verification of the results. Patient anonymity was ensured by assigning an identification code to each patient. The processes of data collection did not interfere with patient management or nursing care. The data were collected and recorded according to the time points shown in Figure 1, and general data, such as the type of test, day of the week, and nursing shift, were also recorded. The data were analyzed using SPSS version 11.5 software (SPSS Corp., Chicago, IL, USA). All time points were entered, and time intervals were calculated in hours. The total TAT for each test was calculated as the sum of all six time intervals. In some urgent cases, the sampling was done before the physician ordered the tests. In these cases, the test ordering to sampling intervals were corrected to zero. Descriptive statistics, including the mean, median, standard deviation, and interquartile range (IQR), were used for time data. To compare the time data to TATs during different nursing shifts and days of the week, the Student’s t test and a one-way ANOVA were used. A P value of less than 0.05 was considered statistically significant. During the study period, time data were obtained for 1400 tests ordered by physicians in the ED of this university hospital. Of these, 525 (37.5%) were hematology tests (CBC, PT, and PTT), and 875 (62.5%) were chemistry tests (FBS, BUN, Cr, Na, and K). Of the total number of samples, 72 were excluded due to hemolysis (10), specimen loss (12), or incomplete data collection (50). Thus, the TATs of 1328 tests were calculated. The total TATs in hours during the different nursing shifts and days of the week are shown in Table 1. Approximately one-fifth (21.9%) of the tests were done during the morning shift (7:00 AM to 2:00 PM), 30.1% were analyzed during the midday shift (2:00 PM to 7:00 PM), and 47.8% occurred during the night shift (7:00 PM to 7:00 AM). The mean total TAT for all the tests (chemistry and hematology together) in the morning shift was significantly longer than in the night shift (2.8 ± 1.2 hours vs. 2.0 ± 0.7 hours, P < 0.001). Of the 1328 tests, 1194 were done on weekdays, and 134 were done at weekends. Among the weekdays, the longest TAT (2.5 ± 0.9 h) was on Sundays, and the shortest TAT (1.9 ± 0.7 hours) was on Fridays (a weekend day in Iran) (P < 0.001). The mean total TAT of all the tests ranged from 1.3 to 3.1 hours, with a median of 2.0 hours (IQR = 1.5 - 2.8), and 90% of the tests were completed within 3.5 hours. Table 2 shows the contributions of the two main phases (prelaboratory and laboratory) to the total TAT during different nursing shifts and days of the week. The laboratory phase accounted for a significantly larger proportion of the total TAT (57.4%) than the prelaboratory phase (P < 0.001). Figure 2 compares the six time intervals that contributed to the total TAT for hematology and chemistry tests. 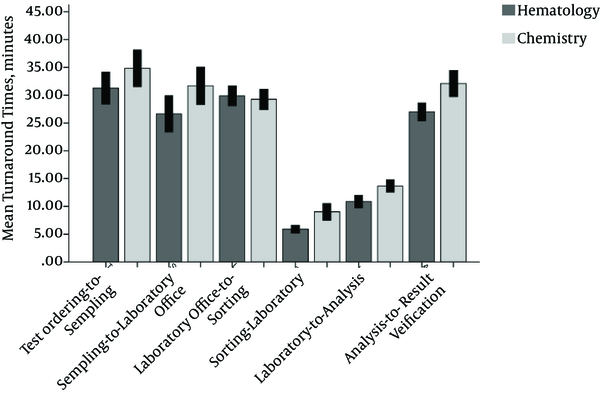 The sorting to laboratory, laboratory to analysis, and analysis to result verification intervals of chemistry tests were significantly longer than those of hematology tests (P < 0.001). Although direct observation of work processes is often challenging, it is sometimes necessary to obtain answers to unresolved issues. Tracking the time intervals for laboratory TATs makes it possible to identify weak points, improve the quality of care, and decrease the economic burden of patient care (13). This study was designed to measure the mean total laboratory TATs for hematology and clinical chemistry tests ordered by the ED and determine the relative contributions of the prelaboratory and laboratory phases to the total TAT. Features that distinguish the present study from other surveys were the prospective design and close observation of all the time intervals that constituted the total TAT from test ordering to result verification and reporting. Moreover, it compared times across different days of the week and nursing shifts. In this study, the mean total TAT was 2.28 ± 0.9 hours, with a median of 2.0 hours (IQR 1.5 - 2.8 hours) and a 90% completion time of 3.5 hours. To the best of our knowledge, there are no official national benchmarks with which to compare these results. Therefore, we compared our results with those from other countries. These comparisons showed that the mean TAT in this university hospital setting was different from that in other countries. As a benchmark, the 1996 Q-probes study (a nationwide survey in the U.S.) reported a median TAT of 130 minutes for BUN and 120 minutes for white blood cell counts (14). In 2007, Hawkins reported that the initial goal was to complete 90% of common laboratory tests within 60 minutes (2). In 2010, the median TAT for 9492 troponin tests was 107 minutes (range 73 - 148 minutes) (15). In contrast, in an Indian laboratory, the mean TAT from sample reception to report was 5.5 hours for routine inpatient samples (4). These large differences in TATs can be explained by differences in the study settings and participants, for example, teaching vs. nonteaching hospitals, numbers of beds, and the degree of computerization in different laboratories. In the present study, the comparisons of nursing shifts and days of the week showed that the shortest mean TAT was recorded during night shifts and on Fridays. According to the one-way ANOVA, these results were statistically significant. Although the numbers of inpatient tests were higher during the night shift than the other shifts, the mean laboratory TAT was shortest during this period. In view of the lower workload attributable to outpatient’s tests during the night shift, this apparent paradox may be explained by the fact that the total laboratory workload during the night shift is lower than in other shifts. Another possible explanation may be the lower laboratory workload due to the arrival of fewer outpatient samples. An additional factor that may have contributed to the shorter TATs during the night shift is that health care providers and the patient’s family are more concerned about receiving the tests results promptly from the laboratory. During all nursing shifts and on all days of the week, the contribution of the laboratory phase to the total TAT was significantly higher than the prelaboratory phase. 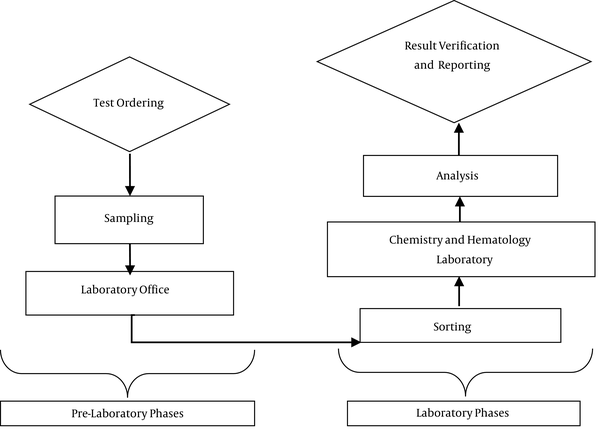 The laboratory phase comprises the sum of the laboratory office to sorting, sorting to laboratory, laboratory to analysis, and analysis to verification intervals. Based on our findings, sample transportation and sorting appear to be the rate-limiting steps in laboratory TATs. Although the time intervals for chemistry test TAT were longer than for hematology test TAT, the differences were statistically significant for only three of the laboratory phase time intervals. This finding is consistent with the results of a study by Goswami et al. in 2010, who found that the mean intralaboratory TAT was higher for electrolytes and routine chemistry than for prothrombin time (4). Compared to hematology tests, chemistry tests require a larger number of processes, and the calibration of analytical devices is more complex and time consuming than for hematology test equipment. A number of important limitations need to be considered. First, as close tracking is challenging and requires adequate financial support, this study was carried out in a single ED at a tertiary teaching center. Although this university hospital is a major reference center in southern Iran, our results cannot be extrapolated to all hospitals in the region. Second, the hospital information system was not designed for research projects, and not all time intervals of the laboratory TATs were recorded in the system. Therefore, double checking the data was problematic and sometimes impossible. Third, although we informed staff about the main objective of the study, the Hawthorne effect was not zero. In conclusion, this study suggests that the mean TAT in this university hospital is longer than available benchmarks. We recommend that the Iranian Ministry of Health establish national guidelines with clear definitions of TATs, as well as all start points, end points, and intervals, and that it undertakes to assess health care performance parameters periodically. The results of our study are a potentially valuable source of basic information for policymakers, but further investigation to find the causes of the delays and develop interventions to solve this problem will be necessary. The authors wish to thank the deputy chancellor of Shiraz University of Medical Sciences for financial support and K. Shashok (Author AID in the Eastern Mediterranean) for improving the English in the manuscript. This article is based on work done in partial fulfillment of the requirements for the MD degree awarded to F. Javidialesadi (project number 92-01-01-6677, Shiraz University of Medical Sciences). Authors’ Contribution: Hamideh Mahdaviazad contributed to the conception and design of the study and the analysis and interpretation of the data, drafting the article, and final approval of the article. Fatemeh Javidialesaadi contributed to the data acquisition, drafting the article, and final approval of the article. Massood Hosseinzadeh contributed to the data acquisition and interpretation of the data, drafting the article, and final approval of the article. Seyed Masoom Masoompour contributed to the design of the study, critical revision of the content, and final approval of the article. 13. Lab turnaround time and delayed discharges: a systems-based action research investigation. Proceedings of the 2005 International System Dynamics Conference.